Our vision is an expression of our drive and desire to assist and educate our clients to achieve and benefit from optimal health mentally, physically and spiritually. Alpha Cleanse goals are to greatly enhance quality of life by rejuvenating the body through stimulating and supporting its natural ability to regulate itself, so you can reclaim your health. 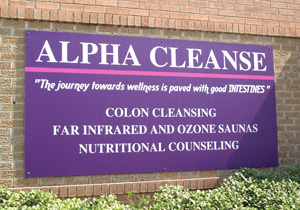 Alpha Cleanse was established in 2000 by Donna J. Otey, proprietor. Donna is a certified colon hydrotherapist, a member in good standing since 1997, of the International Association for Colon Hydrotherapy (I-ACT), a member of the National Board for Colon Hydrotherapy and a member of the International Association of Colon Hygienist ,currently holding a board position with that group. Donna is a certified instructor of colon hydrotherapy and operates a school for training in Fort Worth,Texas. She is a licensed massage therapist, MT009887, in the state of Texas since 1994.